Awarded HOSTELWORLD 2018 1st, Country Winners Ecuador, 2018 TripAdvisor Travellers Choice Award. A quiet alternative guesthouse for those looking to re-boot, re-energize and re-charge. Carpedm Adventures was founded in 2007 and has been successful offering programs such as Galapagos, Amazon and Quito Daytrips. In early 2015, we brought you Caiman Eco-lodge for those looking to connect with the Amazon Rainforest. Now we are bringing you Casa CarpeDM. Explore the city upon arrival with our signature Free Walking Tour Monday to Friday. If you are looking for a social vibe, then enjoy dinner/drink with our partners from Secret Garden Hostel where we have our travel agency located just 1 block south from Casa CarpeDM. Get the best of both worlds fun in evening and a good night sleep in Casa Carpedm to begin your day with a smile on this side of the Equator. Casa Carpedm has 15 rooms. A small 3 story home that has accommodation of 9 Matrimonial rooms, 5 twin rooms and 2 dorm rooms. No Curfew - we provide you with access to the hostel 24 hrs. 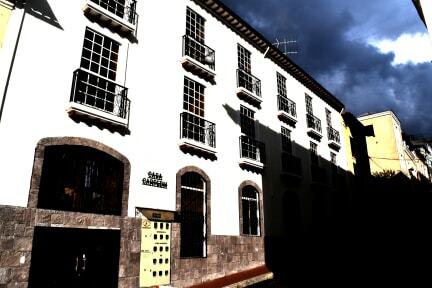 The best hostel we’ve stayed in and a must stay in Quito!! More like a hotel, the breakfast is great and the view that goes along with it is beautiful! The staff couldn’t be more helpful and the hostel is spotless. We loved it here so much we extended from one night to four. Paul is a wonderful person. 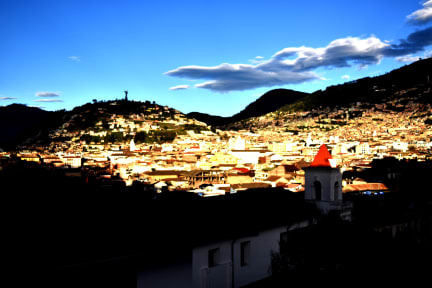 He helped us make arrangements and gave good tips for exploring Quito and its outskirts. I ended up extending my stay for a week. Breakfast is nutritious & filling, and the dorm is so spacious (single beds, not bunks!). The view is breathtaking too. The only thing that bothered me was a slight sewage smell in the ensuite toilet when it's heavily used. Airing it often & ensuring the floors are as dry as possible helps. Otherwise, CarpeDM is spotless and so comfortable! Very well managed hostel, spotlessly clean, comfortable beds, hot powerful showers, good breakfast, very helpful bilingual staff, in a quiet location near Old Town. Everyone has been very helpful with any questions or concerns I had, the staff is great. A very nice and clean hostel. Really great hostel and can help you with so many different trips and adventures throughout Ecuador! Thanks Paul! This was our first hostal stay and it was incredible! Paul and Gisselle where incredibly helpful with any and every question we had. Helped us find vegetarian food and get a detailed route to anywhere we wanted to go. This felt more like a hotel it was so clean and welcoming. We would recommend this stay to everyone we know! Casa Carpedm was more a bnb than a hostel. Still very nice! Paul and his staff are excellent, he is quite knowledgeable about the surrounding areas. They have a tour agency at the secret garden one block over which we booked a Cotopaxi tour which was excellent. Breakfast on the enclosed roof terrace is a great way to start the day too! Nice hostel - booked two rooms, one twin, one double. Atmosphere was pretty quiet but the sister hostel (Secret Garden) round the corner is a bit more lively with a nice rooftop bar. Free walking tour was excellent. Sheets weren't clean in double room when we arrived and had to get them changed. Breakfast was basic but nice and staff very friendly.